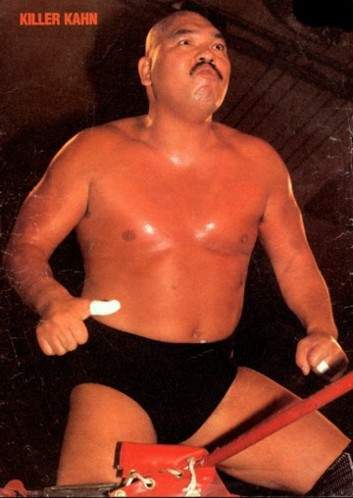 Killer Kahn used to spit green mist like The Great Muta, The Great Kabuki and Yoshihiro Tajiri would later do..
Killer Kahn “allegedly” broke Andre The Giants ankle during a match, but it was a work so Andre could take time off for surgery..
1981: Killer Kahn’s feud with Andre the Giant was voted “Feud of the Year” by Dave Meltzer’s Wrestling Observer Newsletter..
Ron Valliere wrote Being that I was raised on World Class Championship Wrestling I thought you might find the following info useful for the Kahn profile and maybe a few others. Killer Kahn was a key player in a major world class storyline(which took place in the mid 80’s) that led to one of the most historic moments in wrestling history. The story begins: Terry Gordy leaves fellow Freebirds Michael Hayes and Buddy Roberts behind in the U.S. to briefly tour Japan. While in Japan Gordy meets Killer Kahn and a friendship is born. Kahn teaches Gordy the Oriental or Asiatic Spike. Gordy returns to the states with a dangerous new offensive weapon and a powerful new ally. The Freebirds plan to use Kahn to give them an edge over their hated rivals the Von Erich Bros. and also to establish themselves as the premier rule breaking group in world class which infuriates General Skandor Akbar the boss of Devastation Inc which at that time included Kamala, Missing Link, Great Kabuki, and the Super Destroyers. The Freebirds began feuding with both the Von Erichs and Devastation Inc. over “control” of World Class Wrestling. Some particularly brutal matches took place between Gordy and Kevin Von Erich, Gordy and Kerry Von Erich, and Kahn and Kevin. By this time World Class officials discussed banning the Spike because of the toll it was taking on other World Class stars. However the move was not banned. In a stunning development General Akbar secretly bought the services of Killer Kahn and Kahn turned on the Freebirds. Gordy, feeling responsible for Kahn, vows to destroy Kahn. The feud was a brutal one and neither had a clear advantage before world class officials stepped in. World Class officials felt that normal referees could no longer control or be safe in matches involving Gordy and Kahn. World Class officials decided that Gordy and Kahn would square off one more time with a special referee- Kerry Von Erich ! Terry Gordy defeated Killer Kahn and finally ended the feud. After the match a bloody Terry Gordy and Kerry Von Erich shake hands in a sign of mutual respect ! Just to add a little more info on Killer Kahn. I’m pretty certain Kahn didn’t start spitting green mist until he re-entered the WWF in the later 80’s. Kahn also did not use his infamous oriental spike in the WWF. Kahn did not use mist in World Class which was before he re-entered the WWF. Kabuki was using mist in the early 80’s which means Kabuki was using it well before Kahn. Also Killer Kahn feuded with Out Back Jack during that late 80’s WWF stint. If I remember correctly I believe Kahn’s finishing move during his late 80’s WWF stint was a knee drop from the top rope and his manager was Mr. Fugi. Kahn’s late 80’s WWF stint was so short that to my knowledge he did not appear on a PPV ; however I think he did receive a few untelevised title shots against Hulk Hogan. Also Kahn wrestled barefoot during his late 80’s WWF stint despite wearing boots for a majority of his career.